UStu had seen covered bridges before but, for me, the Burfordville Covered Bridge was only the second one I had ever seen! 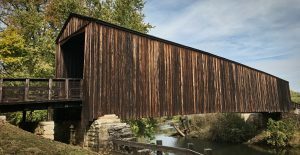 Take a backroads trip to the oldest remaining covered bridge in Missouri-the Burfordville Covered Bridge! With its location by an old mill, this covered bridge looks like a Currier & Ives print! There were 30 covered bridges in Missouri but only four covered bridges remain. Construction on the Burfordville Covered Bridge began prior to the Civil War. The bridge was completed in 1858 by Joseph Lansmon, a well-known builder from nearby Cape Girardeau. 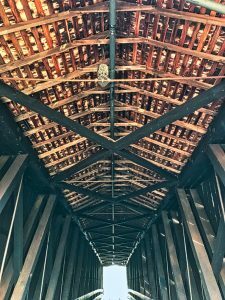 He used the Howe truss design, patented in 1840. In this method, the diagonal wooden members are crossed with vertical iron rods in tension to form the trusses. The Burfordville Covered Bridge was a part of the toll-road systems connecting Burfordville, Jackson and Cape Girardeau, Missouri. Bridges were primarily covered to provide protection to the iron and timber trusses from harsh weather. Historical records show that there was once a toll house on the end of the bridge. At the time the bridge was in operation, toll roads and bridges were common and usually operated by private businesses. According to the Southeast Missourian newspaper on April 26, 2013, a traveler on foot was 3 cents. A horse, mule or ox was 9 cents. A one-horse wagon was 37 cents. And crossing faster than a walk brought a fine of a dollar! Tolls on the Burfordville Covered Bridge were charged until 1906, when local farmers broke down the gates and used the roads without paying. The Burfordville Covered Bridge is only open to pedestrians now and is located beside the historic Bollinger Mill (see our post at: http://thetravelingseniors.com/take-a-backroads…site-in-missouri/). 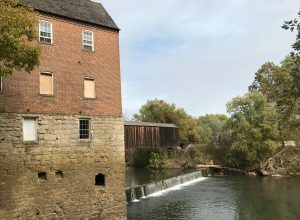 Historians agree that having a covered bridge located next to a mill is unusual and creates an important historic site. Both are now on the National Register of Historic Places. Give yourself a treat and visit this beautiful bridge in Missouri! From the intersection of US-61 and MO-34 (south of downtown) in Jackson, take MO-34 west approximately 7 miles to County Road 360. Take a left and go south on County Road 360 approximately 2 miles to Bollinger Mill Road. Turn left on Bollinger Mill Road until the road ends at the historic site.